Born into a bourgeois family in Le Havre, Northern France in 1901, Jean Dubuffet was to become one of the most radical artists of the post-war era. He was violently opposed to the classical ideal promoted in western culture and is best known to many as the champion of self-taught artists. 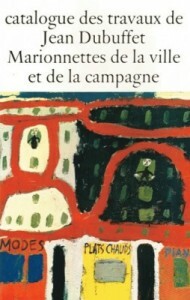 A prolific painter, sculptor and writer, in his own work Dubuffet refused to conform to one style, working instead through successive cycles which demonstrated his unorthodox approach to materials and technique. In 1945 Dubuffet coined the term Art Brut. This referred to his concept of an alternative creativity, which he recognised as “completely pure, raw … (and) … invented in all of its phases by the artist, from his impulses alone”. He amassed a vast collection of works made by psychiatric patients, prisoners and marginalised individuals, whose visionary freedom opened up new possibilities in his own practice.